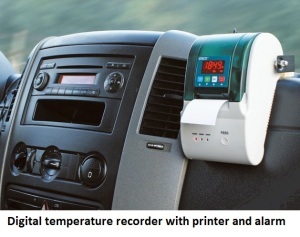 This Recorder is for printing regular reports of the temperature inside a vehicle compartment. 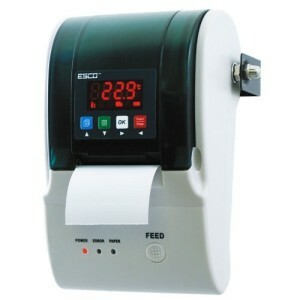 This device has a display of the current readings, alerts as well as inbuilt recording. There is a small display in which we can see the current recordings and alerts. 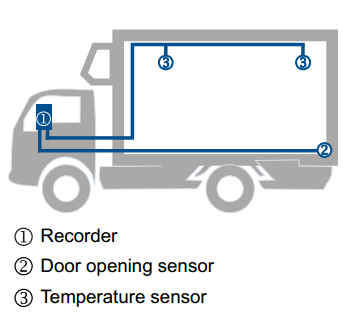 There are two sensors which can be connected to the refrigerated compartment and the device can be mounted in the driver’s cabin. Minimum and Maximum temperature limits can be programmed into the device. Upon reaching these limits, alerts will be displayed on the device with a beep sound. This is basically an electronic temperature data logger additionally fitted with a printer. It offers all the features of a normal temperature data logger including alarms, indications, a large memory capacity, etc. Apart from the facilities of a data logger, it also can record the door opening through another set of sensors. The measurement data are stored in non-volatile memory of the recorder. The customer can program the frequency of the data collection in the range of 30 seconds to 20 hours . The memory capacity is 30,000 readings, which will be equivalent to 625 days if reading is taken every 30 minutes. Once the memory is full, the recorder continues to record the latest readings, while the oldest readings are automatically erased. The stored data can be erased, through the password-protected m enu. 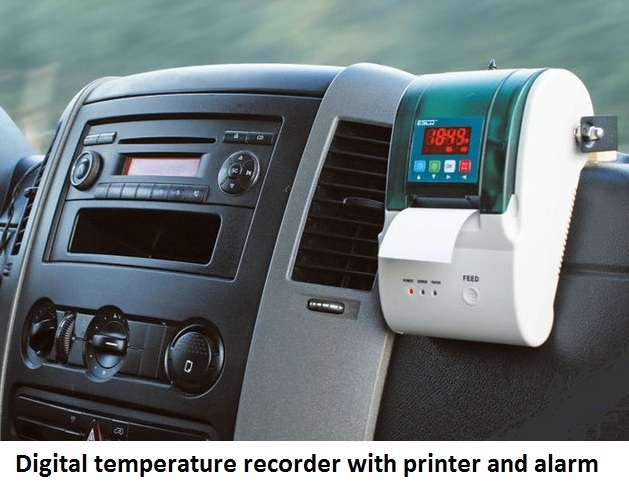 The recorder is equipped with a printer from which the driver can print data for any period of time. During initial programming, the user can program the vehicle details in the device so that the report indicates the vehicle details. The report will include the temperature Vs time details, alert events etc. The sensors can be placed at a distance of 5 meters from the device. The device will operate on 12 V / 24 V DC. Also, same can be connected to regular AC power supply through a DC adapter. The user can simply download the stored data using a USB flash drive without the need of a computer. The device is ideal for transportation of temperature controlled goods especially having multiple deliveries throughout its journey. At each location, the driver can take a print out of the temperature data and issue to the customer. Thus the customer can make sure that his goods were kept at the desired temperature throughout the journey. We list below few of the major features of the device. There are two temperature sensors and one door sensor. We can multiply door sensors to connect multiple doors. It is possible to record the opening of doors in the recorder. Loud audible and visual alarms are available in the device for alerting the driver. The user can program high and low levels of alarms. The end user can download the recorded data through USB flash memory without the need of a computer. The user has to insert the USB flash drive into the recorder and data is automatically copied as an Excel file. We can connect the device directly to the electric power of the vehicle (12 VDC to 24 VDC). Recorded data of specific duration can be printed. You can extend the sensor up to a length of 5 meters for each sensor. The device is manufactured in in Europe. The accuracy of measurement is 0.1°C. Resolution of the display is 0.1°C. Alarm types are Audible (beep) and visual. The number of sensors is two. Temperature measurement range is from -40°C to 100°C. Type of printing paper is thermal paper. Printing is by a single button operation. This printer has to be fixed in the vehicle with sensors also properly wired inside the vehicle. Also please see our portable data logger with a printer if you do not want to fix the printer inside the vehicle. The advantage of this particular model is that you can record the data until the goods reach the doors of the client eg. a data logger inside a thermally insulated box. You can pick up the data logger from the box and take a print of the readings.